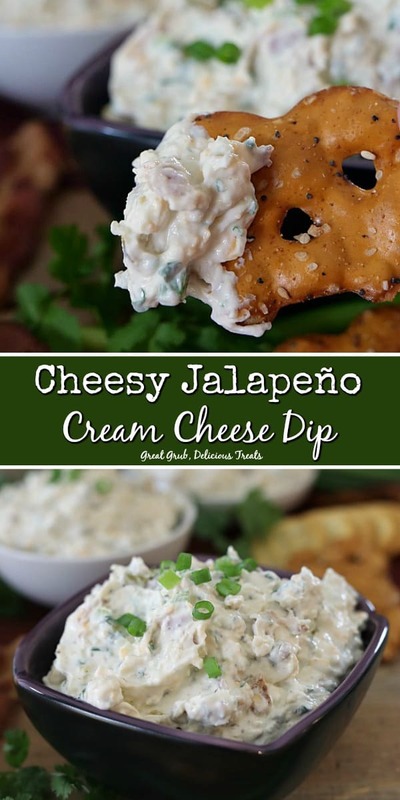 This cheesy jalapeno cream cheese dip is an amazingly delicious dip recipe that doesn’t look all that good, but it is scrumptious! 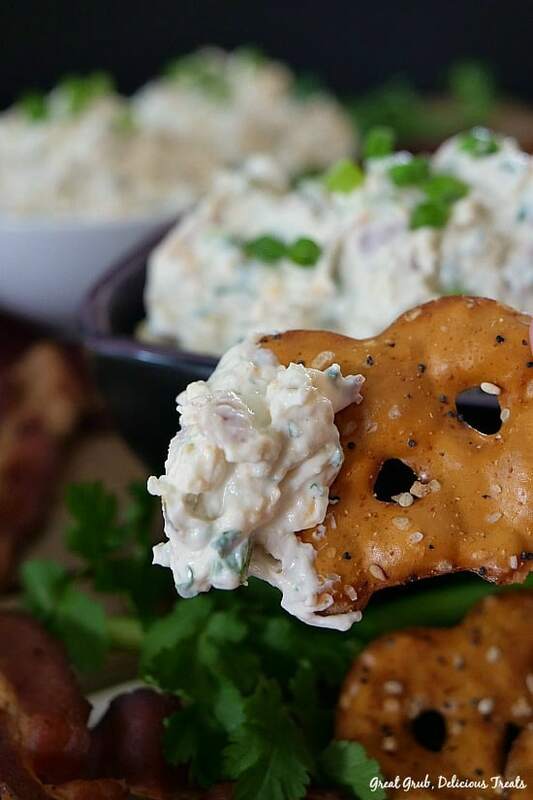 Grab your favorite crackers and dig in. 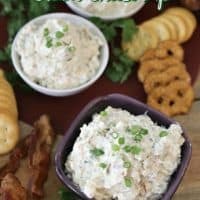 Seriously, this is a fantastic cream cheese dip recipe that has lots of different flavors and tastes sinful scrumptious. 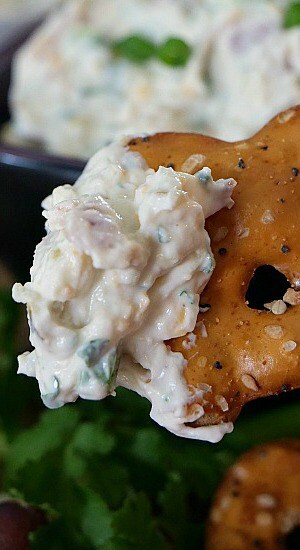 Let me tell you a little story of how this cold cream cheese dip recipe came about. It is actually my man’s concoction. Larry, aka my man, always gives his opinion and on occasion offers descriptive help when I’m writing my posts. On this day, Larry had been talking about a dip that he wanted me to make and he wanted to use yogurt instead of sour cream to help cut out some of the calories. He then hopped in the car and headed to the grocery store. 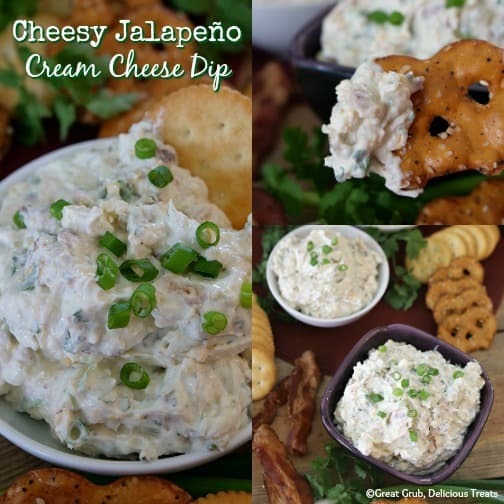 Once Larry returned from the store, I immediately started making this cheesy jalapeno cream cheese dip. Let me share this with you… it totally is incredible. 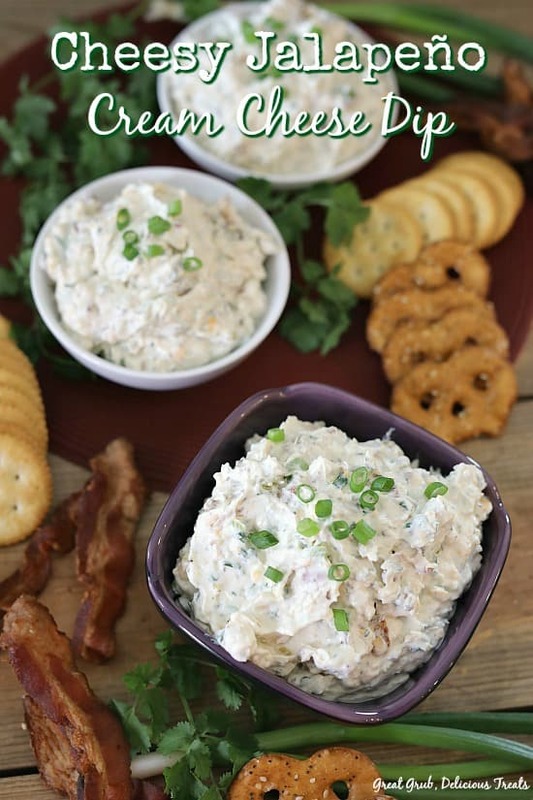 He definitely had a great idea for a delicious cheesy cream cheese dip recipe. It’s “top notch” as he would say. As a result, we’ve made it twice in one week, it’s that good! 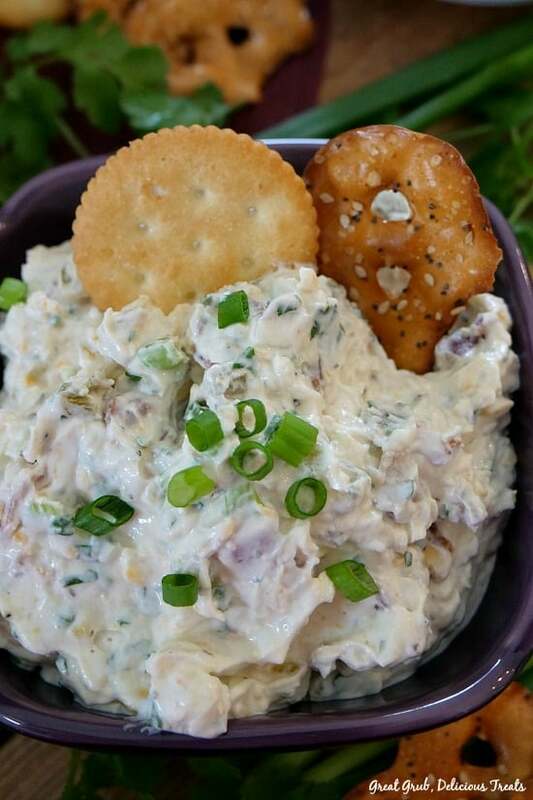 So delicious, this recipe is an easy cold dip recipe that would also be tasty heated up as well. To serve it hot, mix everything together and add mixture to a 2-qt casserole dish that has been sprayed with a non stick spray. Next, place baking dish in a preheated oven at 350° for about 20-30 minutes or until the dip is heated thoroughly. 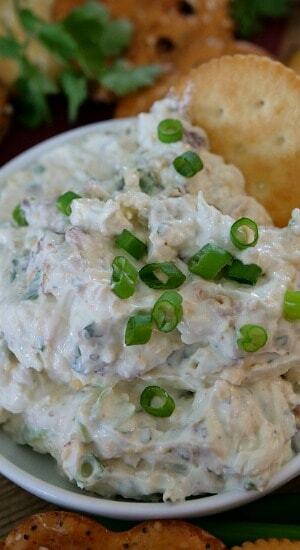 Remove from oven and serve with your favorite chips or even served on top of a baked potato. This would be a great filling for stuffed jalapeños too. So tasty and it definitely has a bite to it. 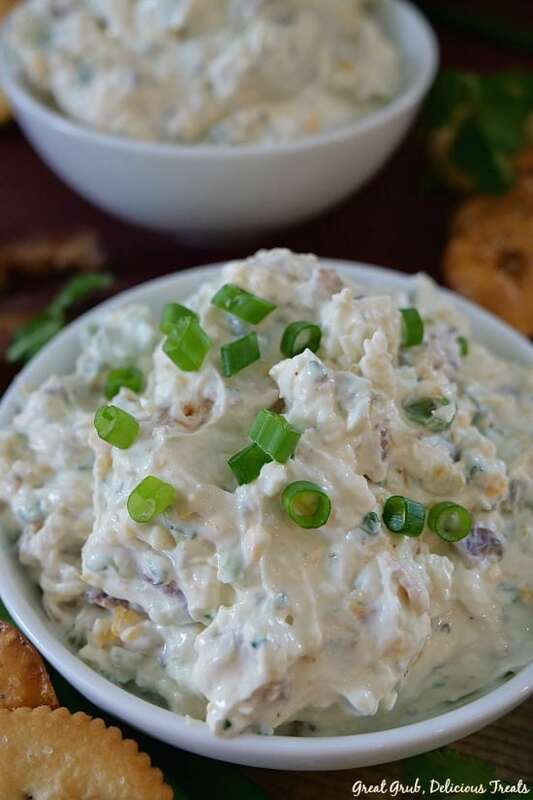 Here are a few more delicious dip recipes that can be found on the blog: Cheesy Jalapeno Bacon Dip, Cream Cheese Chili Dip, Spicy Spinach Artichoke Dip, Spicy Hummus with Avocado, Fresh Spicy Guacamole, plus many more. Fry bacon until crispy then place fried bacon on a plate lined with paper towels. Once cool enough to handle, crumble and set aside. In a large mixing bowl, beat cream cheese on medium speed until creamy then beat in yogurt until combined. Add remaining ingredients, stir and chill until ready to serve. Can you use jarred “tamed” jalapenos? Do you have a recipe to “tame” fresh jalapenos?